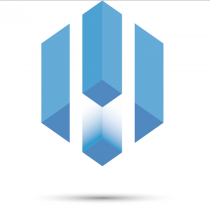 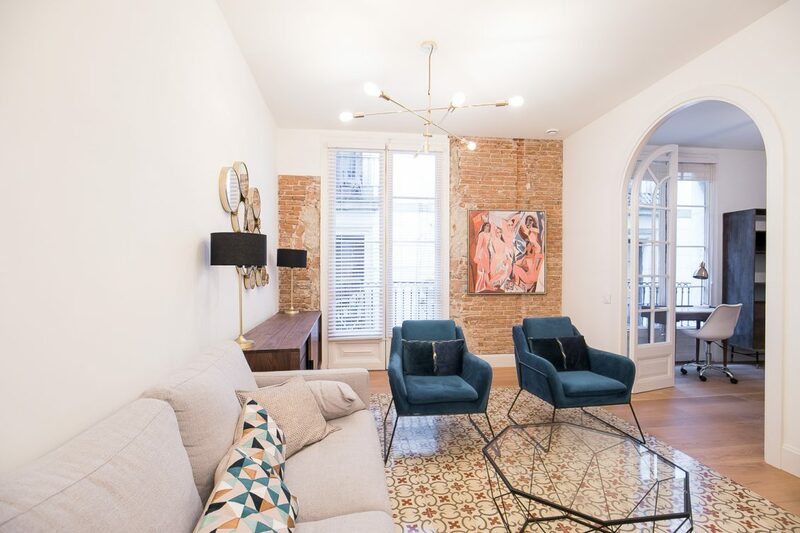 Price : 2.500€ | Deposit : 5000€ | Agency fee 3 to 5 months : 2118€ | Agency fee 5 to 11 months : 3025€ . 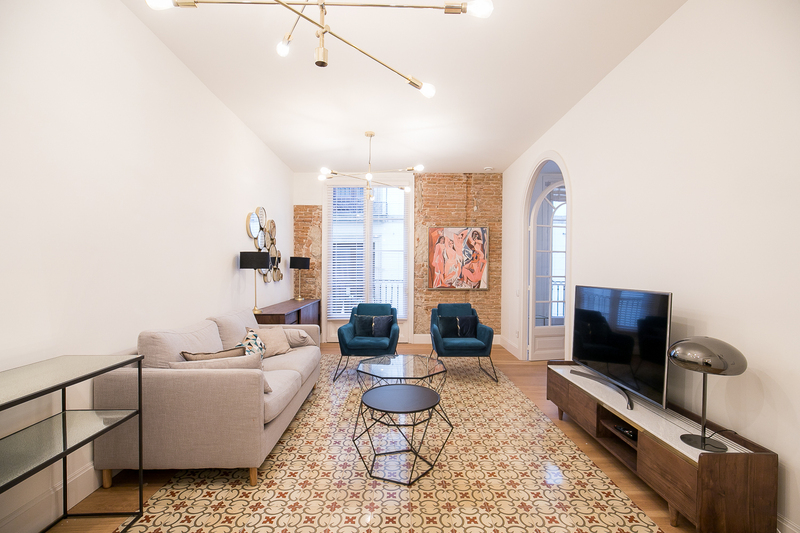 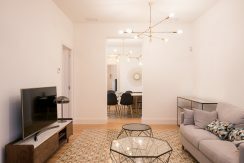 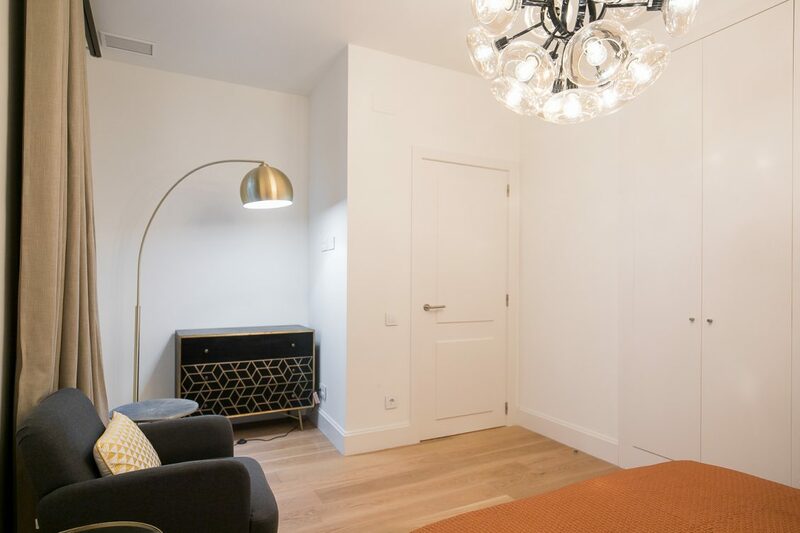 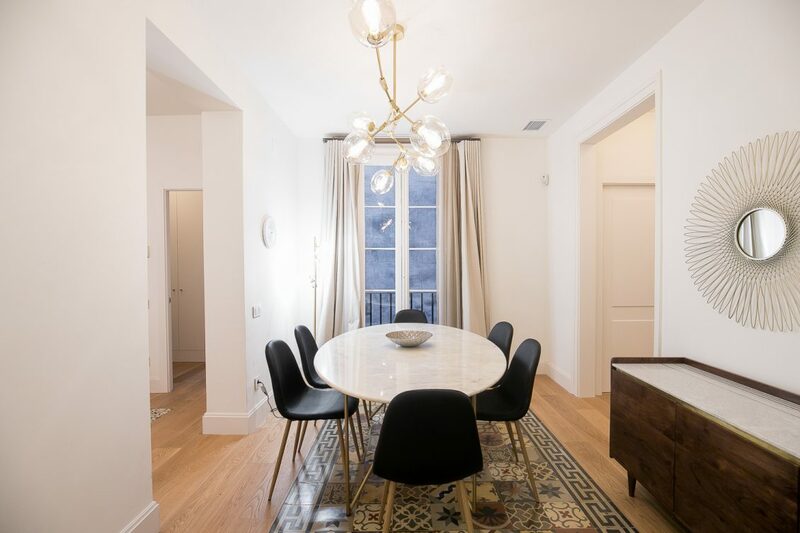 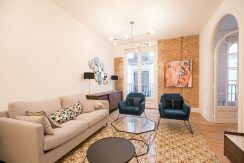 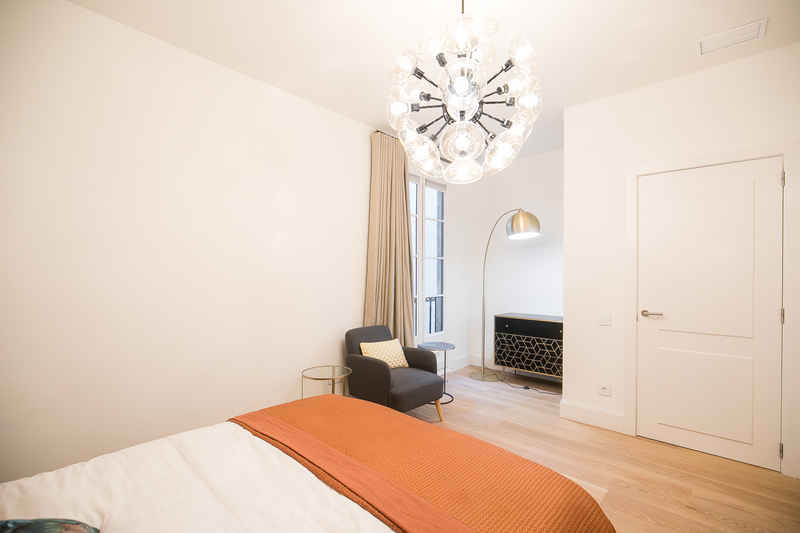 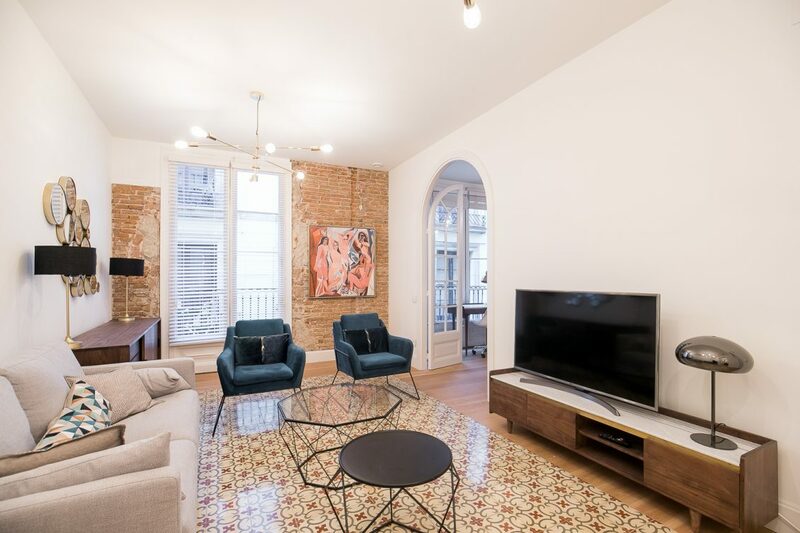 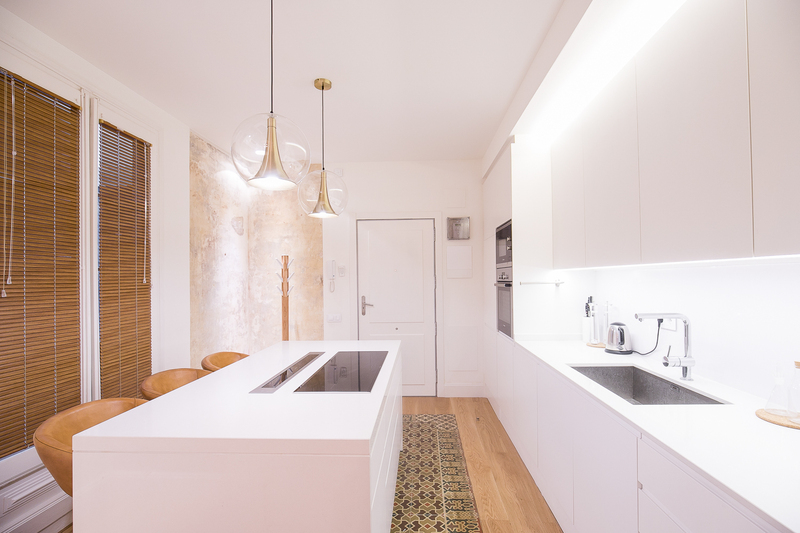 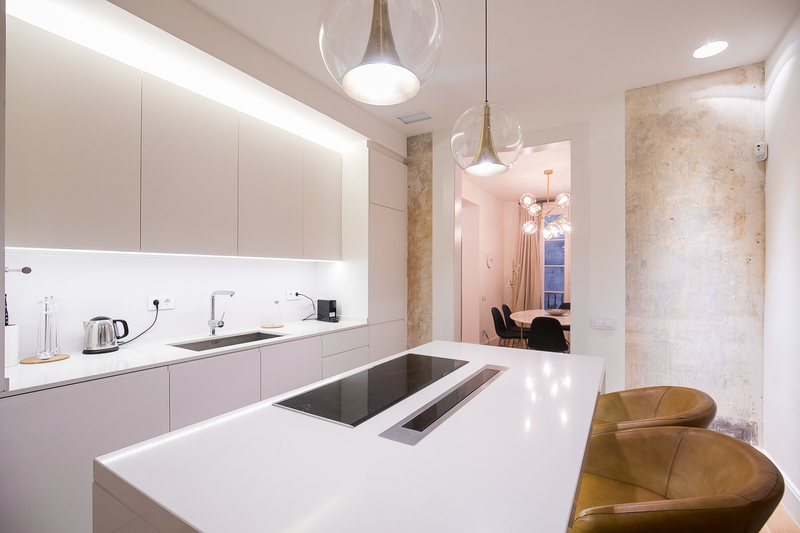 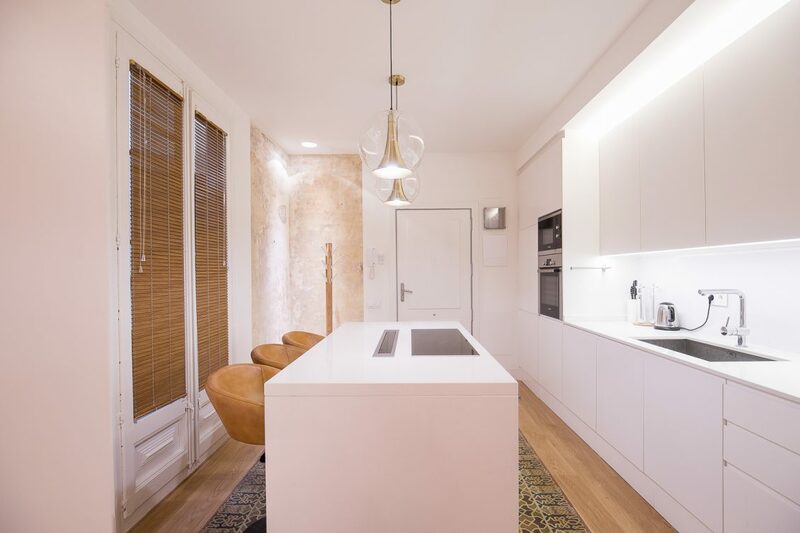 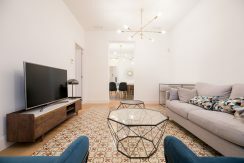 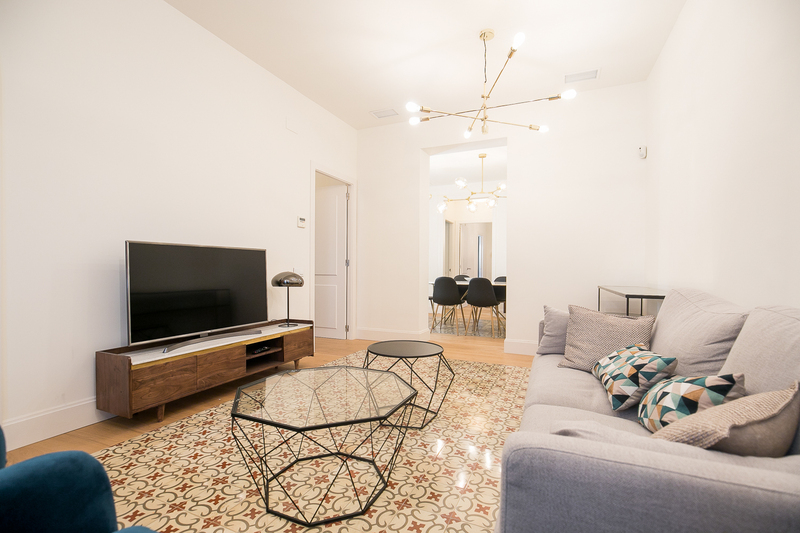 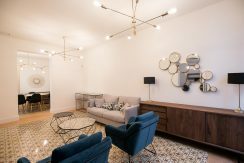 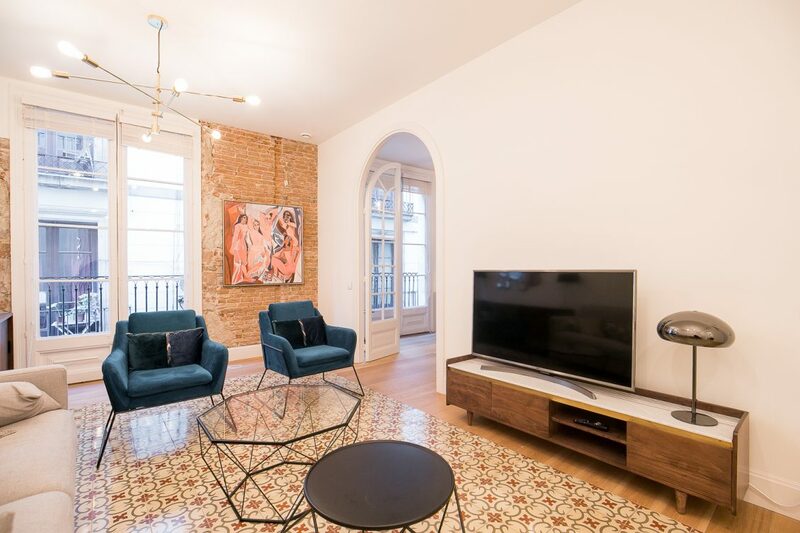 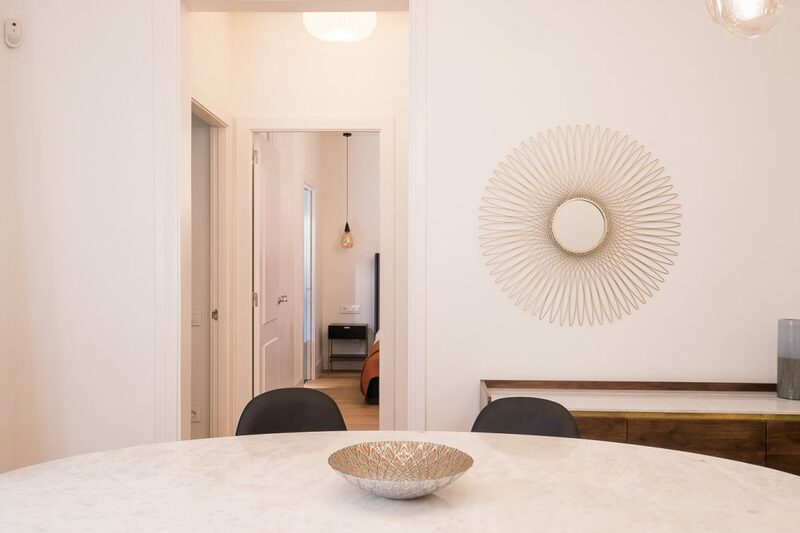 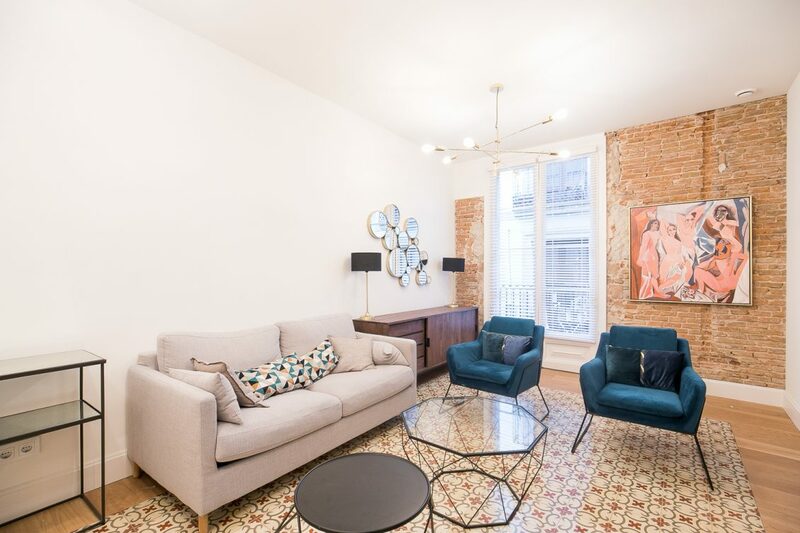 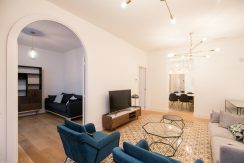 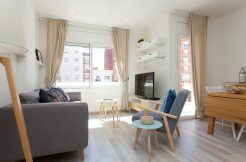 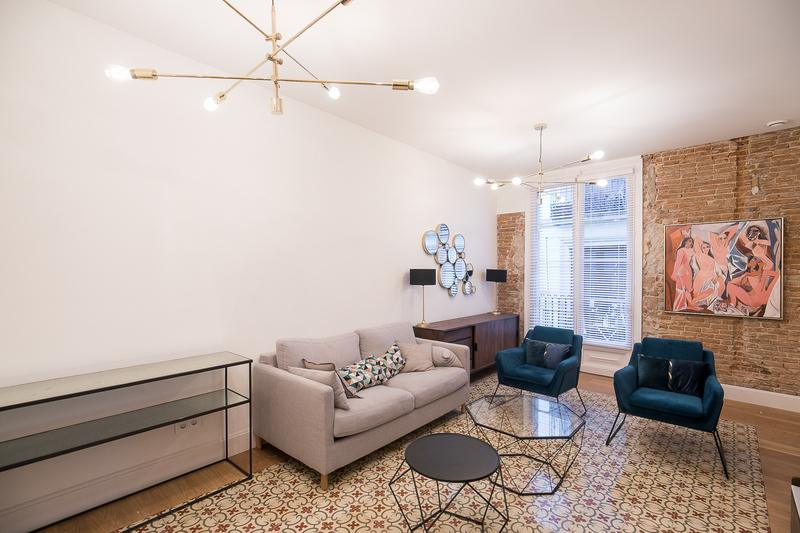 Beautiful apartment of 125m2, located in the Gotico district of Barcelona. The apartment is on the second floor (with elevator). 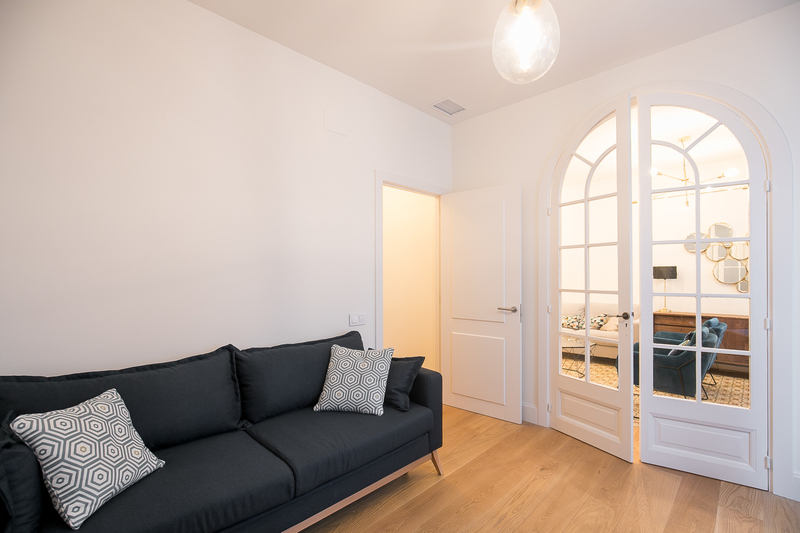 To enter the apartment, it will first enter a corridor (closed by a key lock). You will find two other apartments on the same floor. Formerly, the three apartments were one and separated. 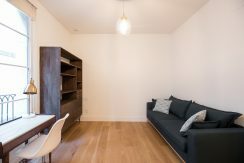 The apartment is located in a corridor, where only residents on this floor have access. 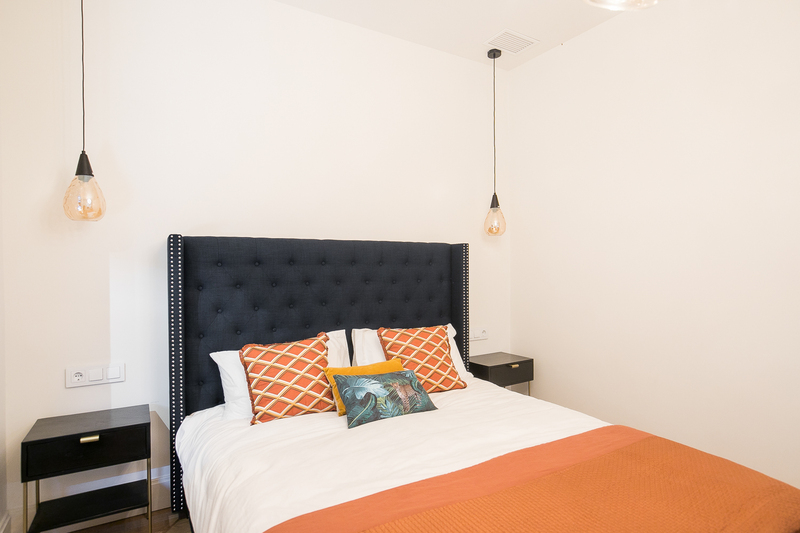 Finally, the apartment is equipped with a security alarm. 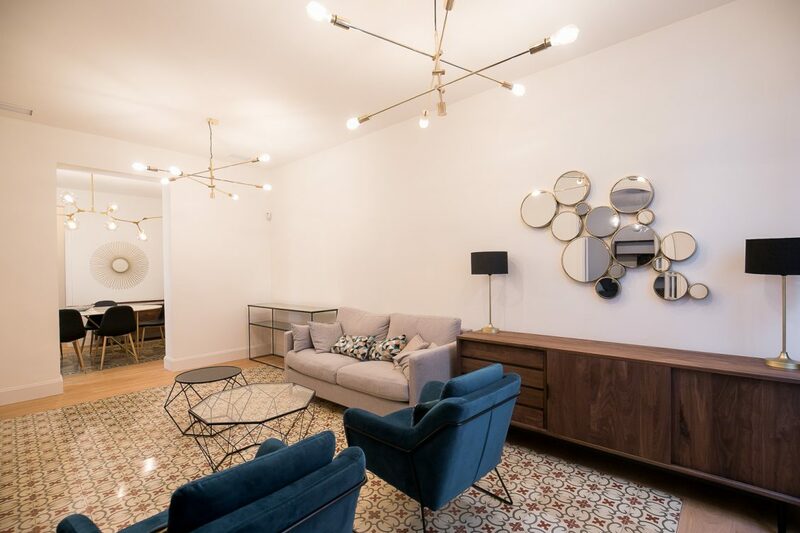 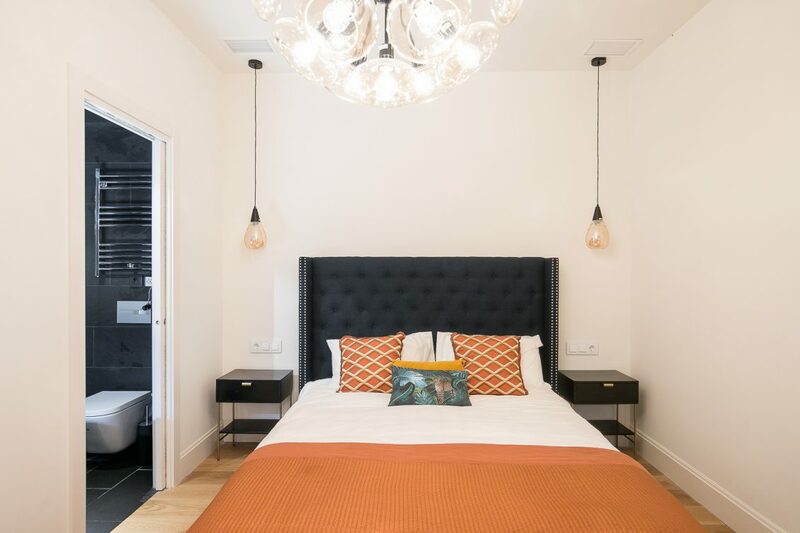 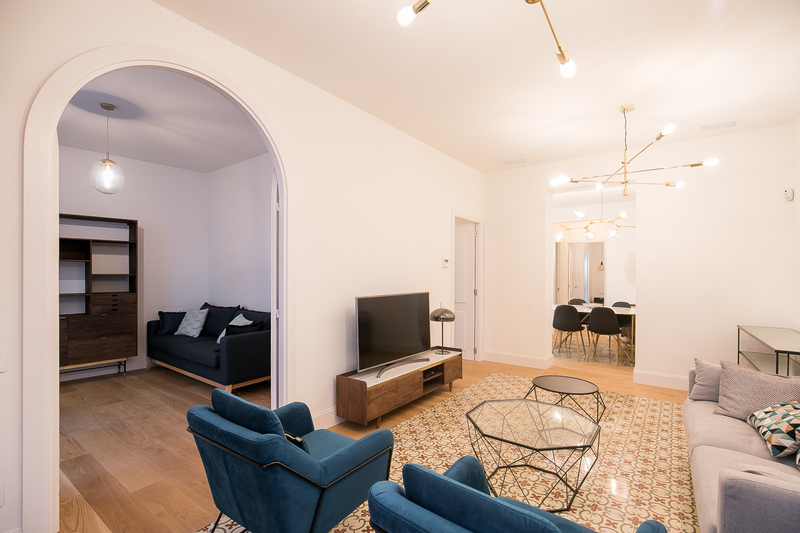 This spacious apartment recently renovated and fully equipped, is composed of a large American kitchen, a pleasant living room, and a beautifully decorated dining room. There are also three bedrooms as well as three bathrooms. The whole apartment has a high ceiling which brings a lot of volume to the rooms. 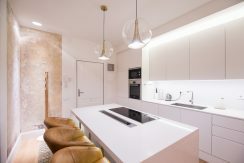 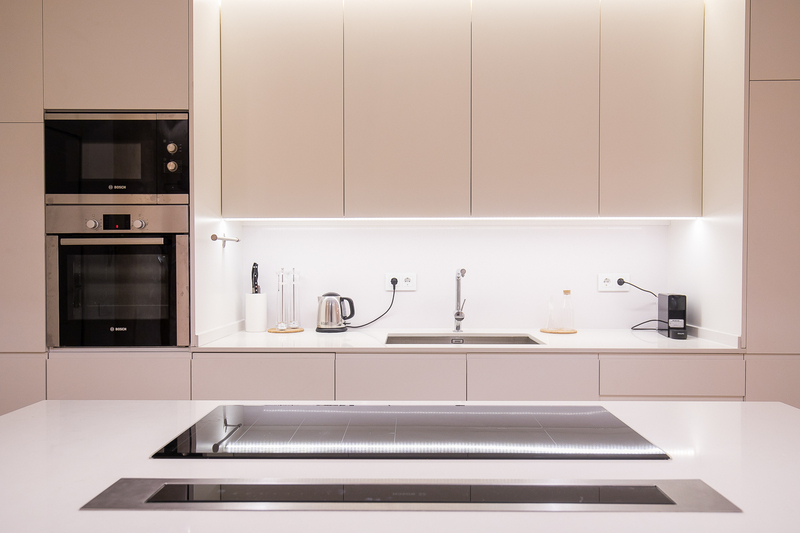 The kitchen, very modern and refined is equipped with an oven, induction hob, a coffee machine … but also a washing machine and a tumble dryer. 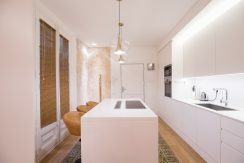 The layout of the room will allow you to cook facing your guests (worktop facing the bar) and makes this kitchen very friendly. Some walls of the kitchen were left rough. 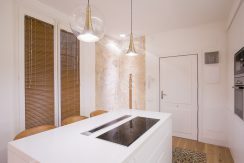 The contrast of stone and new furniture creates a warm atmosphere and is the charm of this room. The dining room has a large stone table that seats six people. The room is decorated soberly but tastefully. In the living room, very spacious, you can relax in front of the television on the sofa or in the armchairs that compose the room. There are two consoles to store your stuff. Like the rest of the apartment, the living room is nicely decorated and the mix of brick walls and modern room is interesting. 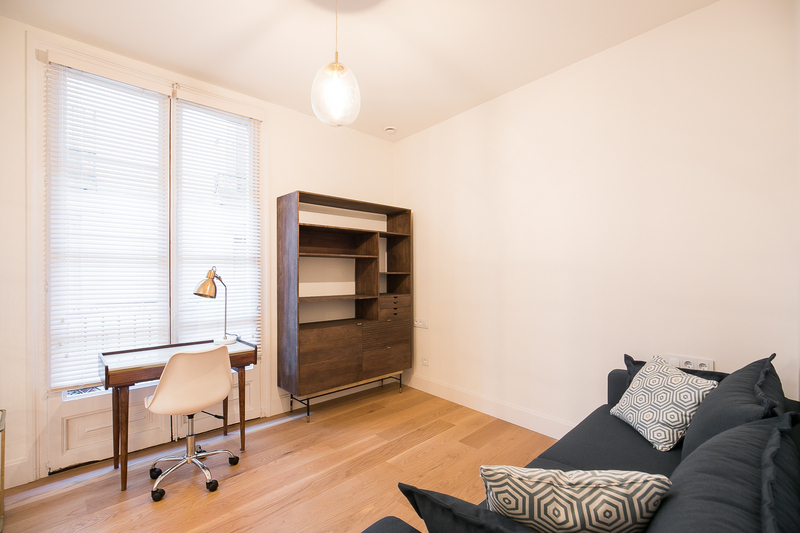 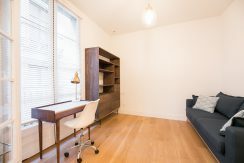 In the first bedroom, accessed through the living room, there is a sofa bed and a work area. 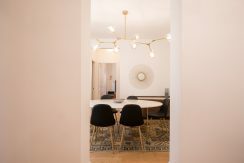 The office is facing a window that brings brightness to the room. The first bathroom is next to this room. 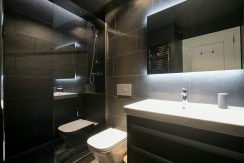 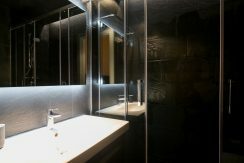 In a modern style, it is composed of a shower and a large basin. Between the bathroom and the bedroom, there is a dressing area to store your clothes. 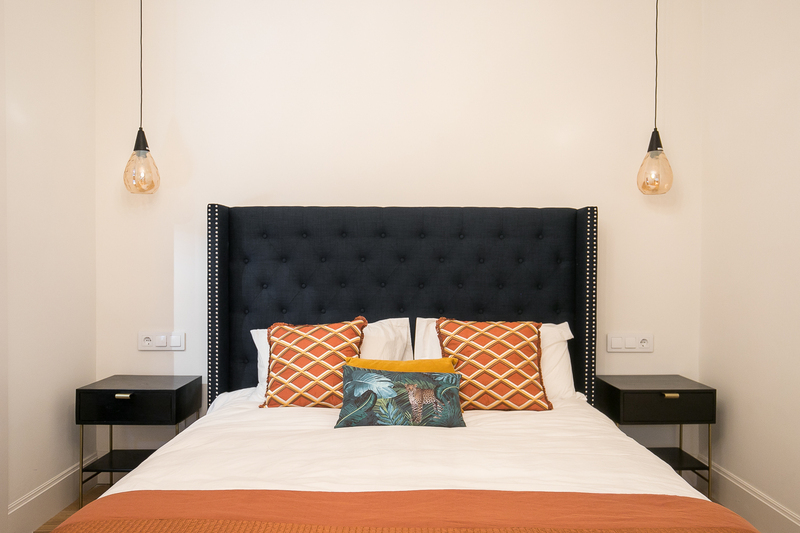 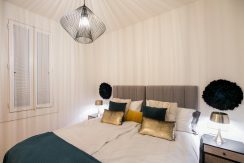 In the second bedroom, very cozy and well decorated, you will find two single beds that have been joined together to create a double bed. 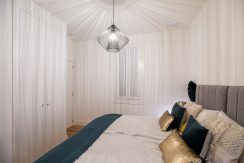 There is also a wardrobe/closet and a private bathroom with a shower and sink. 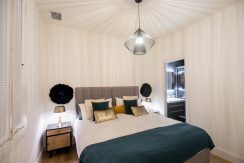 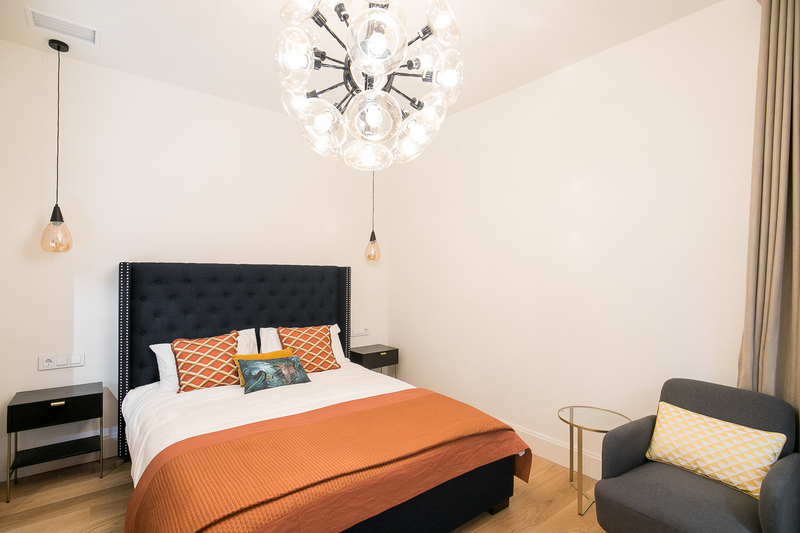 The third bedroom, more spacious, consists of a double bed and a relaxation area with an armchair and chest of drawers. 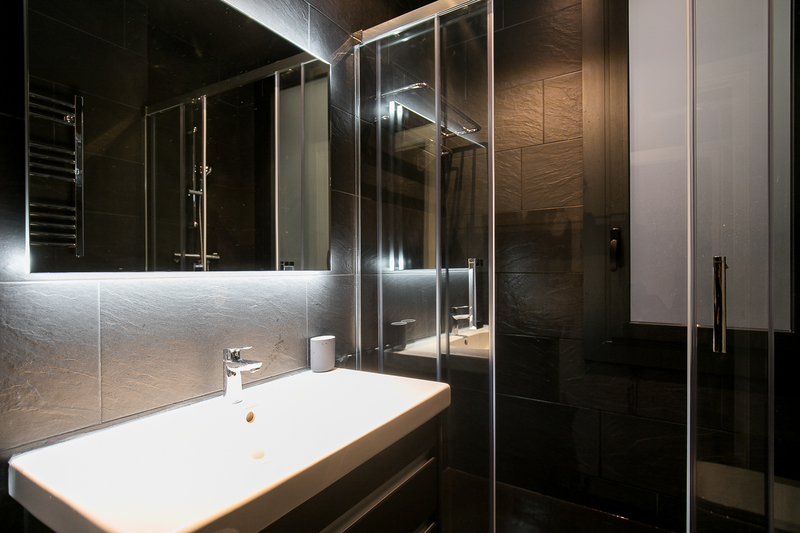 It also has its private bathroom with shower and sink. The Gotico district of Barcelona is the emblematic district of the city. 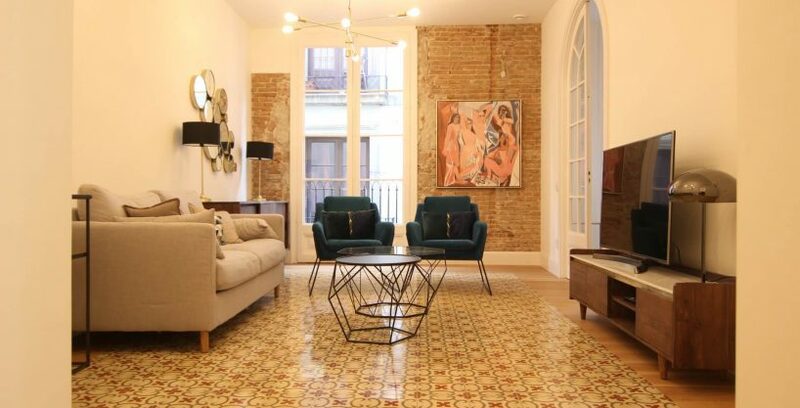 Steeped in history and therefore very touristy, it is an old district in the heart of the city. There are many places to visit such as Reial Square. 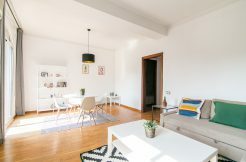 The port is a few minutes walk from the apartment. You will have plenty of time to walk along it.